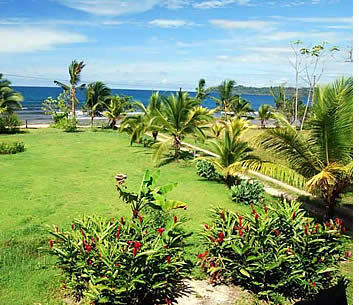 Bocas Bay Villa: luxurious 3.5 bedroom seafront home on the northern coast of town with stunning views. 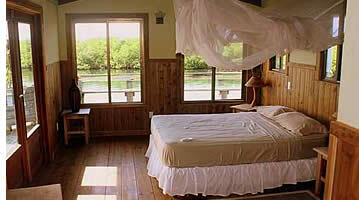 Casa Saigon Bay: 3 bedroom Caribbean house, built directly over the water on the edge of Saigon Bay. 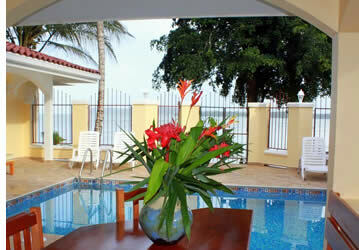 Bocas Beachfront Villas: 2 luxurious vacation villas with shared swimming pool right on Big Creek Beach. 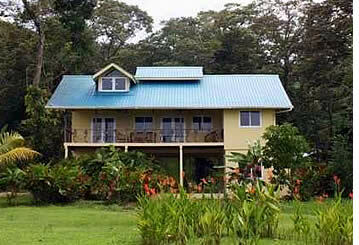 Casa Caribbean Paradise: 4 bedrooms + loft, beach front house out of Bocas Town, right by the surf! 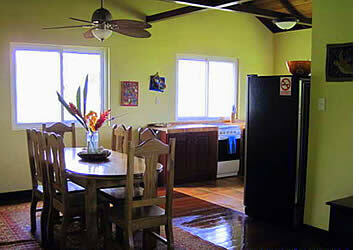 Rental Listings: local newspapers, forums, bulletin boards and classified ads with listings of Bocas rentals. 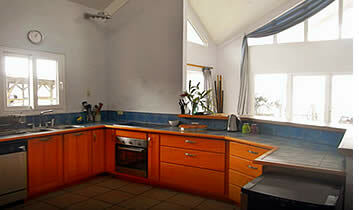 Real Estate Agents: contact an agent in Bocas. Only Habla Ya Spanish Students are eligible for the special rates for extended stays that appear on this page when they make their reservation through us. These special rates are offered to our students due to the amount of traffic that we generate for these rentals. Most of our recommended lodging options are located within walking distance to our Spanish school in Bocas del Toro (from 1 to 15 minute walks). If you're looking for upscale accommodation within Bocas Town with mesmerizing views of the Caribbean Sea and all of the facilities and privacy your heart could desire to feel truly at home, then this is the perfect option for you. 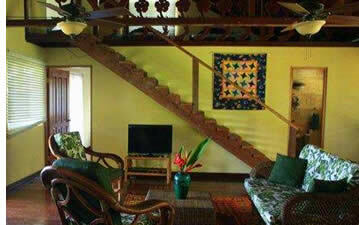 Bocas Bay Villa is one of the very few vacation rentals within town built to this standard. You'll be within a short walk to Bocas' shopping, outdoor outfitters, dining and nightlife, but still far away enough from the hustle and bustle of the busier streets. And did we mention that you can swim of the back of the house in emerald clear Caribbean waters? Having access to your own private dock also allows you to rent your own boat or to be picked up for tours and excursions. Bocas Bay Villa comfortably accommodates up to 8 adult guests within its 3.5 air conditioned bedrooms (fold away beds are available for an additional charge.). The master bedroom has a king bed and its own private bathroom. 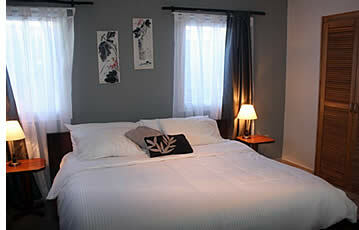 The second bedroom is a family suite made up of a room with a double bed, a bunk bed and a private bathroom as well. Bedroom #3 has a queen sized bed and access to a half bathroom and outdoor shower, which can also be reached from the living areas. All bedrooms are fitted with high quality hotel linens. 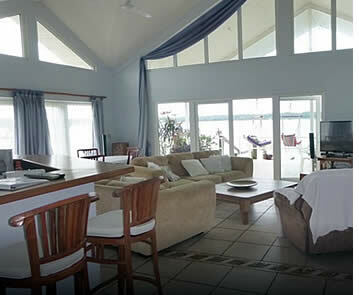 The main open plan living area has a large fully equipped kitchen with dishwasher, wine fridge, breakfast area, a 6 seater dining table, and a lounge with plush sofas, cathedral ceilings and water views on all sides. It's an amazing place for dinner parties with fellow students. And in case you need to catch up with work or just cruise the web, there is also an office space with library and wireless internet access – plus a large selection of games for those rainy days. The huge backdoor deck has 270 degree views of the Caribbean Sea and surrounding islands, and is the ideal setting for the most memorable and intimate dining experiences be it with your family or a group of friends. There is also a glass-bottomed ocean kayak for your use along with additional water toys. Truth told, in Bocas Town it doesn't get any better than this. Amenities include a daily maid service and laundry (there is a small charge for personal laundry), boat and road access, wheelchair-friendly access, flat-screen 3D TV, A/C in bedrooms and hot water in indoor showers. Spa packages are available in house as well, provided by Bocas' finest professionals..
* Note: reservations require a 50% deposit and may be cancelled up to 60 days prior to arrival with a one night cancellation fee (at the daily rate) and the rest will be refunded. There is also a $75 cleaning fee and a $500 security deposit at the time of check in. Total amount of stay is due upon check in. Security deposit is returned at the end of your stay. No-shows and reservations cancelled within 60 days automatically lose their security deposit. Depending on the time of the year and availability, for stays longer than 4 weeks, rates can sometimes be improved. High season goes from Christmas and ends with Easter. National Holidays are also considered high season. A 5 minute walk away from Habla Ya Bocas del Toro Spanish School (or 1 minute drive), Bocas Bay Villa is located on North Street on the border of Bocas Town. From the airport follow the main street that leaves the airport (Avenida E) and take the first left on Sixth Street, then three blocks north, and you'll have reached North Street and your final destination. If you arrive by boat to Bocas del Toro on First Street, go up north until you reach Avenida F, then take a left and continue five blocks until Sixth Street. Take a right and continue two blocks North until you reach North Street and your vacation rental is on the opposite side of the road. From any of the boat stations or the airport you can always catch a taxi to your destination. An enchanting home built with rich native hardwoods located on the edge of Saigon Bay directly over the water, Saigon Bay House offers visitors an authentic Caribbean experience in true Bocas style. Surrounded by verdant mangroves and the tranquil Caribbean Sea you couldn't wish for a more splendid hideaway on Isla Colón but still allowing you to be within minutes of town. With outdoor deck space on both levels of the house (wrap around balcony upstairs and large patio area downstairs) you'll surely enjoy laying in a hammock and watching the sunset over the lush and uninhabited island to the west, or just contemplating in the distance life passing by in the local neighborhood of Saigon. Casa Saigon Bay can sleep from 8 to 10 people comfortably. 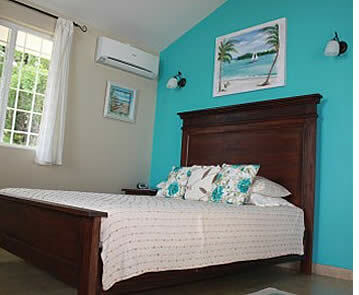 The master bedroom is air conditioned and high efficiency fans can be found throughout the rest of the house. For a soothing night's sleep, each bedroom has hotel quality mattresses (queen beds in three rooms, and two single beds in the third room) and direct access to the outer deck space. With 2200 square feet (200 sq. meters approx.) of indoor living space you'll be able to enjoy an ample and fully equipped kitchen and dining room, living areas both upstairs and downstairs, a bathtub with rain water towers and utility room with washer and dryer. A boathouse and a boat dock are the perfect complement to Saigon House. Upon arrival, arrangements can be made to rent a boat and you're only a short swim or kayak ride to the Smithsonian Institute's dock. Snorkel gear and kayak are included as well. 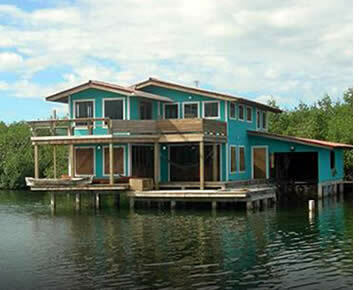 The first trip to the house by boat is included in the rental price but the house can also be accessed by land if you won't have access to a boat. To access the house by land you'll have to make a short walk (5 minutes) down a path (sometimes muddy) and then down a long dock through a small indigenous village (not so clean unfortunately) until you come to the house that is set out by itself over the crystal clear Caribbean waters. 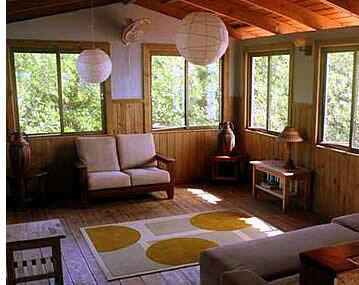 Saigon Bay House is a great choice for families, couples, or groups of friends traveling together. You won't find a 3 bedroom house built over the water so close to town: it gives you the beauty of being immersed in a Caribbean setting over the water and the convenience of just walking a block and being able to catch a taxi into town. You'll only be a 3 minute ride by car to Habla Ya Spanish School (or a 12 minute walk) and a 5 minute drive to town (20 minute walk). A 15 minute walk away from Habla Ya Bocas del Toro Spanish School (or 3 minute drive), Saigon Bay House is located at the end of the Saigon neighborhood just before the Smithsonian Institute. From the airport follow the main street that leaves the airport (Avenida E) and take the first left on Sixth Street, then two blocks north, and then take another left once you have reached Avenida G. Continue until the end of G Avenue until it starts curving to your right and enters La Feria del Mar fairgrounds. Continue on this road until you reach 3/4 of the length of Playa El Istmito and take a left just before the gasoline station. Continue until just before the yellow 3 story apartment buildings and walk through the path leading towards the mangroves. If you arrive by boat to Bocas del Toro on First Street, go up north until you reach Avenida F, then take a left and continue two blocks until Third Street. Take a right and continue on Third Street which merges into Avenida G and continue as detailed above. From any of the boat stations or the airport you can always catch a taxi to your destination. A truly exquisite and one of the very few beachfront vacation properties on the main island of Bocas del Toro, these beachfront villas are real treasures awaiting to seduce you. Located on one of the most gorgeous white sand, swimmer friendly beaches, the villas are only a 5 minute drive from Bocas Town but secluded enough to make you feel in your own private paradise. You'll be greeted by the sound of the water rolling in and will feel as though you just stepped into the tranquility that is the Caribbean vibe. With two mini-apartment style rooms connected by an exquisite pool and patio lounge area (complete with covered grill, kitchen and dining area), it's ideal for couples traveling together, groups of friends or families, as you can rent either one or both of the villas. Each villa can accommodate a maximum of 3 guests each. This private gated property offers you the use of a beautiful pool and patio area to lounge in the sun poolside or relax in our overstuffed sectionals under the covered terrace of each villa. Our built in BBQ poolside kitchen area (shared between both villas), has a gas grill with side burner, 2 burner electric cooktop, large bar sink and a full set of pots and pans, grillware and cooking utensils. The attached custom built dining table is comfortable seating for 2 - 6 people. If you wish to dine out, a variety of excellent restaurants are nearby, or try a meal catered by one of our wonderful local chefs who can cook onsite for you. The villas themselves offer both comfort, luxury and are furnished with 1 heavenly queen size bed and a built in twin daybed designed as a relaxing window seat and sofa. There is a microwave, toaster coffee maker, set of dishes, glasses and silverware for your use. A mini fridge (stocked with drinks such as beer, juices, soda and water) as well as a basket of fun munchies will greet you upon arrival and this is all included in the price. There are books, games & movies provided to help you pass the time and each suite has air conditioning, a 32" LCD flat screen TV and DVD player (no cable TV) and WIFI is available. Also, you can't beat the security that this property offers as it is gated and locked to insure peace of mind at all hours of the day and night. Spending a lazy day on the patio poolside and don't feel like cooking for yourself? No problem! Upon request you can have a delicious breakfast or dinner cooked to order (at prices equal to local restaurants), and enjoy it at either the built in dining table or plush lounge chairs that surround the patio area. For those who want to to hit the water (a 30ft walk from the back gate), there are also boogie boards, snorkel equipment and beach toys available (some upon request) for all your enjoyment needs. Or take a ride into town or to one of the many popular beach spots using one of the two bikes included with each room. In addition, each Villa also comes with a cell phone programmed with all the numbers you'll need for your stay. 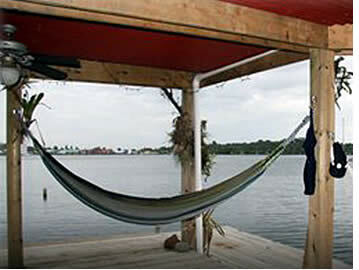 So you'll not have to waste time looking up information, but can just get out and enjoy your Bocas vacation adventure! A 35 minute walk away from Habla Ya Spanish School (or 5 minute drive), the Bocas Beachfront Villas are located at the beginning of Big Creek Bay, just past Hotel Playa Tortuga. From the airport a taxi is suggested and should cost $2. Taxis pass frequently in front of the property and can take you back into town for $1. In case you're walking, take Avenida G, the road that passes in front of the school and leaves town. At the end of it, it will start bending to the right and lead you into the fairgrounds passing in front of Playa El Istmito. Walk the entire stretch of road that borders the beach, passing the Smithsonian Institute and reaching a small bay known as Playa Azul. At the fork continue straight (going left takes you through the island to Boca del Drago and Starfish Beach), pass Hotel Playa Tortuga and you'll find the Beachfront Villas immediately to your right. From any of the boat stations or the airport you can always catch a taxi to your destination. Casa Caribbean Paradise is a bright, spacious, and airy 185+ square meter beach front house (2000+ square feet) located on Playa Paunch, about 8 kms out of Bocas Town (5 miles). Its oceanfront location and privacy allow you to enjoy the sights and sounds of the Caribbean Sea, Bocas del Toro's exuberant jungle, its tropical wildlife, and you simply cannot beat its proximity to some of Bocas del Toro's most renown surf breaks. It's perfect for families or larger groups (can accommodate up to 12 people) and offers guests the perfect setting for a truly memorable Spanish learning vacation in the Caribbean. On the main floor (second level) there is an air conditioned Master Suite with queen sized bed, ocean view, balcony access and its own private bathroom with tub. The Junior Suite with jungle views has a queen sized bed too, is also air conditioned and shares a bathroom with the loft space which has two double beds. The ground floor (first level) has two rooms each with a set of bunk beds and a full bathroom shared between both rooms. The house also boasts a living area with plenty of sitting room for all (with TV, DVD and stereo system), a large porch with majestic ocean and island views (with comfortable outdoor furniture) and a fully equipped kitchen with cooking utensils and cutlery, a charcoal BBQ grill, 2 refrigerators, stove, oven, sink, microwave, an espresso maker, coffee pot, bean grinder, juicer, blender, griddle, toaster oven, etc. There is also a small balcony in the back to enjoy the alluring jungle scene. While sitting on the balconies, one can be serenaded by the ocean waves and jungle noises (birds, howler monkeys, tree frogs, etc). The balconies are perfect spots for enjoying the surrounding landscape filled with tropical foliage (plants, flowers and fruit trees) which draws a variety of tropical birds. There is hot water available throughout the house. There is a large locked storage area for all your gear (surfboards! ), as well as a washing machine. This dream vacation rental comes with 2 bikes, a double kayak, a safe to lock up your valuables and a complete alarm system. Ceiling fans have been installed throughout the entire house, as well as on the front balcony. Casa Caribbean Paradise is child-friendly, but caution is recommended if you have infants or toddlers on the balconies. This house is perfect for those who want to kick back and relax in a place where the untouched tropical rainforest meets the crystal blue waters of Bocas del Toro! 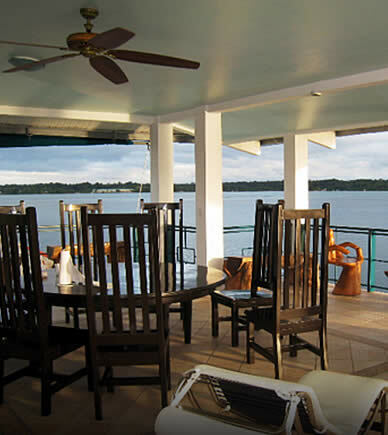 A 12 minute drive out of town you'll be able to experience Bocas at its best while still being close enough to easily enjoy the local charm of Bocas Town. A taxi from town costs around $10 for a full cab, or $5 for 1 person. There are three full service restaurants close to the house, and many more just minutes away by taxi. It is a pleasant, culture immersing 45 - 60 minute walk to the center of Bocas Town. Tiger Tail, one of the first surf breaks that starts showing, is right in front of the property. Paunch, Dumpers and Bluff are just a short walk or bike ride away. When the swell is up, there are only a few spots close by where you can swim in the beach, but a five minute drive towards town takes you to the Big Creek area which has a nice protected bay with white sand beaches where you can swim all year long. When it's not surfing season in Bocas del Toro (parts of April, May, September and October), all the surf spots, as they are reef breaks, turn into gorgeous snorkeling sites! Or if you'd just like to relax and take it all in, just go for a walk by the beach. Note: reservations require a 50% deposit and may be cancelled up to 60 days prior to arrival with a one night cancellation fee (at the daily rate) and the rest will be refunded. There is also a $75 cleaning fee and a $500 security deposit at the time of check in. Security deposit is returned at the end of your stay. Depending on the time of the year and availability, for stays longer than 4 weeks, rates can sometimes be improved. High season goes from Christmas and ends with Easter. National Holidays are also considered high season. 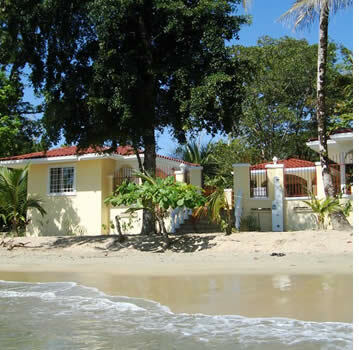 A 15 minute drive to Habla Ya Bocas Spanish School (or 50 - 60 minute walk), Casa Caribbean Paradise is right on Paunch Beach. From the airport follow the main street that leaves the airport (Avenida E) and take the first left on Sixth Street, then two blocks north, and then take another left once you have reached Avenida G. Continue until the end of G Avenue until it starts curving to your right and enters La Feria del Mar fairgrounds. Continue on this road until you reach a Y intersection locally known as the "Y griega" and continue straight, passing Playa Tortuga, the Big Creek Area and Playa Mango until the paved road comes to an end. Continue on the dirt road for about 3 or 4 minutes and you'll see Casa Caribbean Paradise to your left. If you arrive by boat to Bocas del Toro on First Street, go up north until you reach Avenida F, then take a left and continue two blocks until Third Street. Take a right and continue on Third Street which merges into Avenida G and continue as detailed above. From any of the boat stations or the airport you can always catch a taxi to your destination. When you're looking for a house to rent in Bocas del Toro for more than a month, the best way to do it in our opinion is to come, stay at a midrange hotel for a couple of weeks and look around town for yourself because this will be the only way in which you'll be sure to find something that you really want. If you plan to rent for only a month, you might be better off staying at one of the properties featured above on this page, or at the Bocas Island Condos or Tropical Suites. Most of the time, real estate agents will not have a lot of options on their hands if you're not willing to spend more than $1,000 per month. If you're looking forward to spending less, around $300 - $800 per month, the best you can do it in our opinion is to post on the following sites exactly what you're looking for and then you'll get answers with specific houses or apartments that are available for rent. Most people find their house driving around Bocas del Toro, because a lot of places aren't posted on internet sites or with real estate agents. Bocas property for sale, rent, wanted Facebook Group: a group where members of our community can post items for sale or items that they're looking for. You can post here what type of accommodation you're looking for and maybe someone can help. Panama's Craiglist: the 7th most viewed English website in the world also has a section for Panama devoted to housing for sale and for rent, wanted and offered. We recommend posting your specific needs and you'll receive specific answers. Viviun: International Property Listings with upscale more expensive offerings. Encuentra 24: just do a search for Bocas del Toro and then select what you're looking for (to buy, to rent, vacation rental, etc.) and it will normally deliver a good amount of results. Finding the perfect place to rent without previously visiting the area can prove to be a difficult task. If you're looking for a long term rental you may benefit from exploring the area for at least 1 month before you commit to rent a place. This will allow you to see for yourself what options are available in the different areas of town and you'll probably get a better deal in this way. 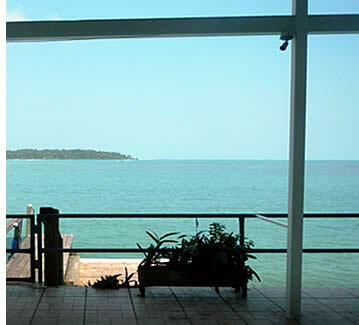 Checkout our list of the best hotels in Bocas del Toro where you'll be able to find the perfect place to stay at that will also suit your budget, and from where you'll be able to setup your base of operations for that first month in Bocas. 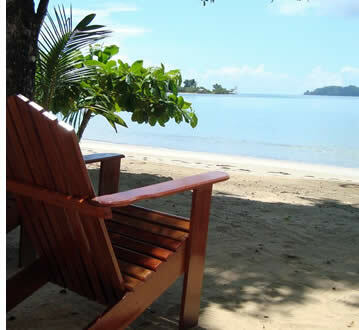 The above are Real Estate Agencies that are known to have offices in Bocas del Toro. We hold no responsibility whatsoever for the business conducted between individuals and any company or individual related to Real Estate. 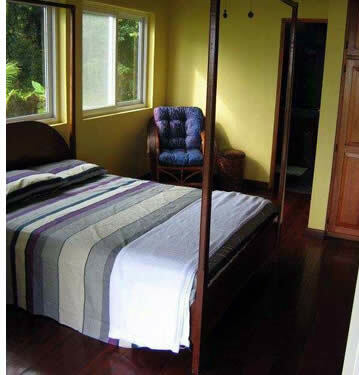 Habla Ya Language Center is only a language school and provides this list of real estate agencies as a helpful tool for those students looking for a property to rent or to buy in Bocas del Toro, and therefore any situation that results as a consequence from using this list is your own responsibility.. Looking for a place to rent in Bocas del Toro?